If you spend much time around kids, you know that one of their favorite things to do is go to the park. We often don’t have time for daily excursions, but we can make sure that our children have a place where they can enjoy playing outdoors. Swing sets are a great option for many youngsters, but which type of swing set is best for your child? Some are made of metal, while others are wooden castles, but they all provide hours of entertainment for our children. Which features will your child get the most enjoyment from? How do you know if the swing set you choose is safe for your child? We have done the research for you, and here are the best swing sets you could choose for your child. Children tend to get bored easily, especially when there are no other children around for them to play with. This is important to remember when purchasing a new swing set as well as a reason to make sure your new swing set has lots of fun things for your children to do. The Lifetime Monkey Bar Adventure Swing Set is designed with lots of fun activities to keep your children entertained for hours. Wooden swing sets can warp and cause children to get splinters, but this swing set is built from a heavy duty steel material that keeps your kids safety in mind. All of the edges are rounded to remove any sharp protrusion, and then they are covered with a soft cap to make sure that accidents do not occur. In addition, the chains on the swings are fitted with rubber grip protectors to keep your child’s fingers from getting pinched between the chain links. The Lifetime Monkey Bar Adventure Swing Set is a freestanding swing set, which means that it does not need to be cemented in the ground for stability. The plastic areas of the swing set are UV protected to prevent discoloration, and the metal is covered with a powder coating that is designed to prevent rust and protect it from the weather. The swing set is also designed to prevent heat retention, which can make a swing set dangerously hot for a small child. This backyard swing set is easy to assemble, if you follow the owner’s manual. It typically takes about four to six hours to completely set up. Always make sure that the swing set is stable and everything is in its proper place before allowing your children to try out their new swing set. Once it is constructed, the swing set should be 18.5 feet long, 13.75 feet wide, and 9.5 feet high. The slide can be connected to whichever side of the swing set you prefer. Just be cautious when setting the swing set up that you make sure that it is at least six feet away from any fences, trees, or buildings. The Lifetime Monkey Bar Adventure Swing Set is designed with children between three and 12 years of age in mind, so it features plenty of fun activities for them to enjoy. It features three belt style swings for them to kick their feet from as well as a set of monkey bars to climb on. It also features a trapeze bar that is designed with a set of gymnastic rings attached, where your children can enjoy hours of flipping and hanging upside down. Once a child climbs up, there must be a fun way to get back to the ground, so this swing set has a fireman’s pole as well as a nine foot slide that is full of waves. Both of these features will give any small child hours of enjoyment. The Lifetime Monkey Bar Adventure Swing Set can be purchased on Amazon for about $990. It is available in two different color options. One features a take on the primary colors and displays red, blue, and yellow across the different aspects of the swing set, while the other features an earth tone display that is a brown and green color combination. In addition, a five year limited warranty comes with the purchase of this swing set. If your child likes to use their imagination to create adventures that keep them entertained for hours at a time, then the Swing-N-Slide Jamboree Fort Play Set is the perfect option for them. The swing set is made from premium cedar wood, which is a type of wood that will be able to endure the wear and tear of being outside in inclement weather situations. It is designed to be a safe environment for your kids to enjoy for hours at a time, so the Swing-N-Slide Jamboree Fort Play Set follows all of the ASTM safety standards to assure that your children will be safe. The swing chains are covered with a rubber grip material that helps prevent little fingers from slipping on the chains or getting pinched between them. Setting up this fort swing set combination for your kids can seem like a daunting task, but it is actually not that difficult if you follow the assembly instructions. It is designed to be set up in a certain way, so make sure to follow the instructions to assure your child’s safety. The fort and the slide should be on the right side of the play set and the swings should appear on the left. All of the wood is pre-cut for your convenience, and the holes are pre-drilled as well. Make sure that once the play set is constructed that you anchor it to the ground in a location that is at least six feet from anything that could hinder or harm a child who is swinging on play set. The Swing-N-Slide Jamboree Fort Play Set is 13 feet in length by 13 feet in width by 9.7 feet in height when it is fully constructed, and its design allows for up to ten kids to play on it at one time. This play set is designed for children between the ages of three and ten, so there are plenty of entertainment options available on the Swing-N-Slide Jamboree. 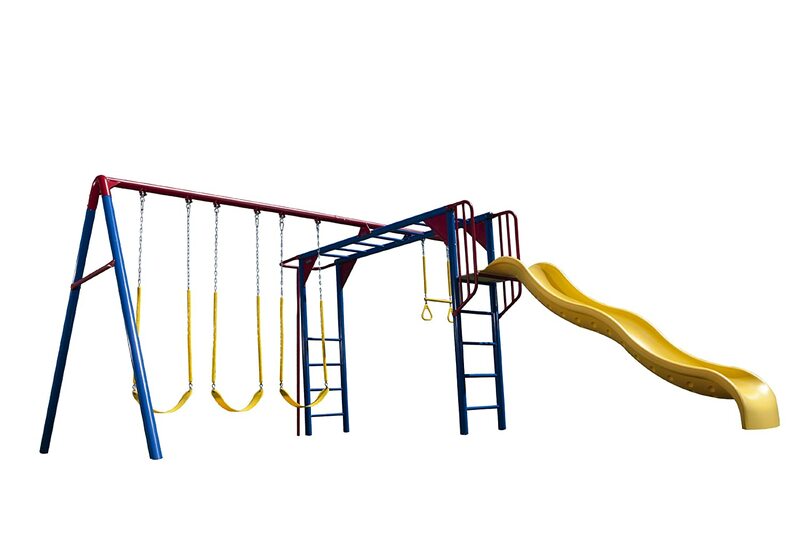 It features two swings that are designed with belt style seats as well as a trapeze bar that is designed with gymnastic rings attached at both ends of the bar. 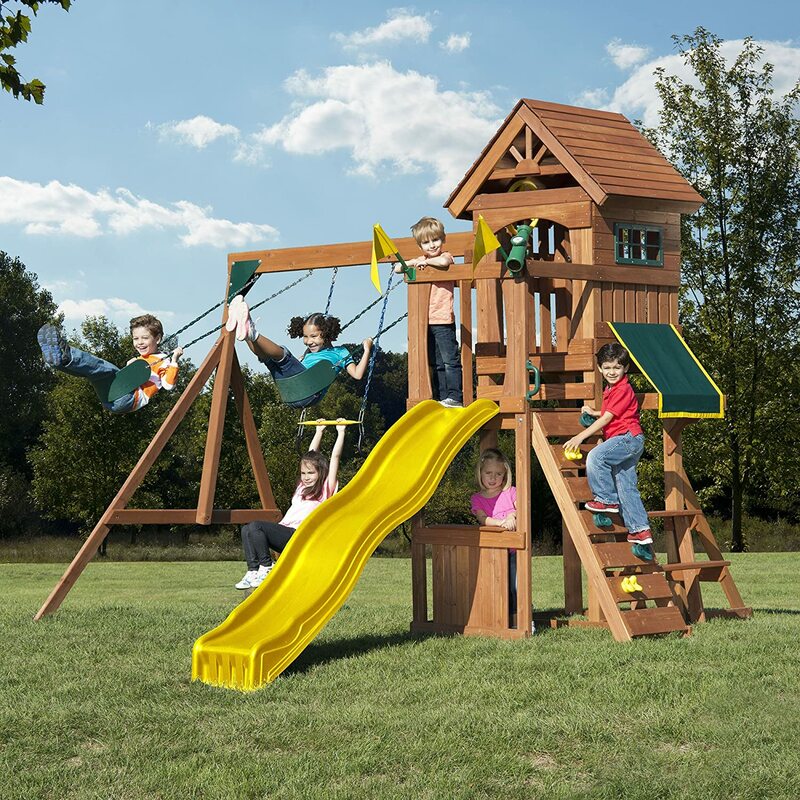 The main feature of this play set is the fort, which is complete with both a covered tower and an open deck area where your kids can imagine anything. It includes two play flags that can be used as a way to surrender to the dragon that is attacking the castle, or maybe the flags are used as swords to defeat the evil trolls who live under the fort. There is also a telescope to utilize in more imaginative adventures. To reach the fort your kids will need to climb a rock wall. In addition, the only way to exit the fort is by way of the extremely entertaining wavy slide. Children who play hard need time to relax and enjoy their lunch. The bottom of the fort features a picnic table and bench combination that is covered by an awning that will protect them from the heat of the sun. This is also a great location to enjoy less strenuous activities like drawing. Parents who reviewed this play set on Amazon all gave the Swing-N-Slide Jamboree Fort Play Set a four or five star rating, so it seems like they were very pleased with their purchase. 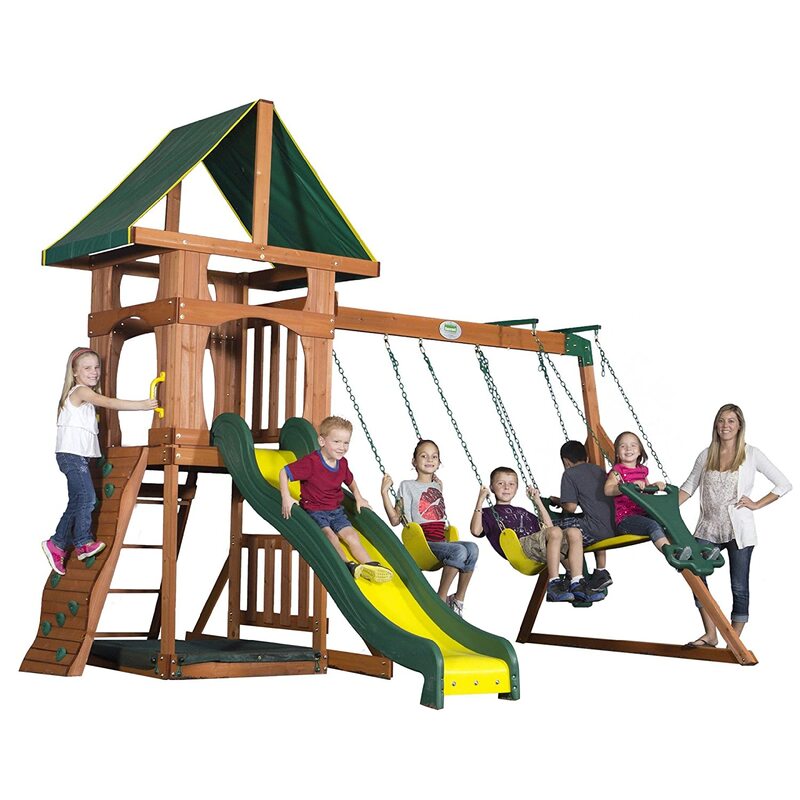 The play set is available on Amazon for about $747, which comes with a five year warranty. In addition, the slide and climbing mountain is covered by a lifetime warranty that covers any cracks and breaks. Backyard Discovery has been manufacturing outdoor play sets for children since the year 1968. They strive to provide you and your family with a safe area that your children will love to play on for years. The Backyard Discovery Santa Fe Wood Swing Set is designed from all natural cedar wood, which is a type of wood that will last for years. The rest of the play set is a plastic material that has been coated to minimize damage from the sun, which is colored yellow and green. Assembly of the Backyard Discovery Santa Fe Wood Swing Set is easy, especially if you follow the manual. All of the lumber is precut to the proper dimensions. The holes have already been drilled so that you know exactly where to bolt the play set together, and all the wood has been stained. All of the hardware components you need to put this play set together can be found in the box. Once the play set is fully assembled, it should measure to be 13.8 feet in length, 11.8 feet in width, and ten feet in height. As with all play sets, make sure that it is sturdy before playtime begins, and also ensure that it is far enough away from any trees or fences. This swing set is built with kids over the age of three in mind. It has plenty of features to keep them entertained for hours as well as additional areas where they can use their imagination to create an epic adventure that they will tell you about upon their arrival indoors. 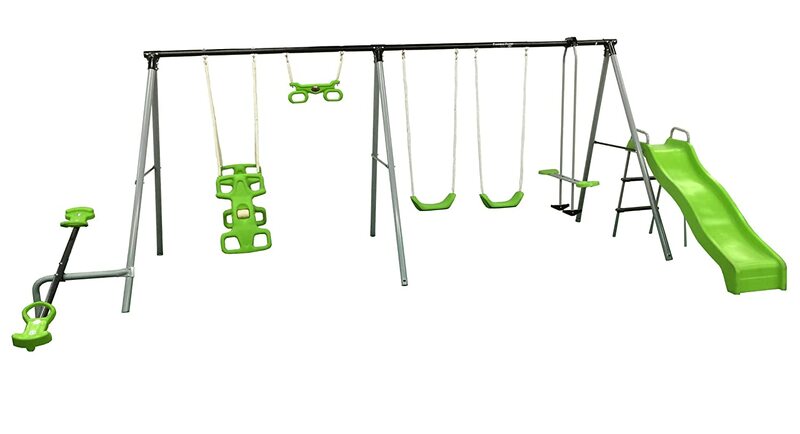 One side of this play set features two belt swings that will provide hours of entertainment. There is also a two person glider that is designed to have the children sit back to back and push against each other to get higher and higher into the sky. The other side of the swing set features a large covered deck where your children can use their imaginations. Maybe the deck serves as a tree house where games can be played or maybe it is a dungeon that holds a princess who must be saved. The deck can be reached by a standard ladder, unless you are a charming prince on a mission to save your princess, and then you must use your strength to climb the rock wall. Be warned, because the rock wall has many curves that could test your child’s climbing skills. The only safe way down from the towering deck is to scurry down the enormous wavy slide, which can be extremely entertaining. The area under the deck is a sandbox, where your kids can enjoy creating sand castles and sculpting sea turtles. The sandbox has a mesh cover to help keep the sand clean and dry. Amazon users who have purchased this swing set have given it raving reviews. 80 percent have rated the product with five stars and one reviewer said this about the Santa Fe Swing Set: “Santa brought this for my two children and he couldn’t have picked a better swing set. Great quality and looks awesome in our backyard. I know it will provide hours of fun for many years to come.” You can purchase this swing set on Amazon for $710. Not every parent is financially capable of purchasing a swing set that has all of the elegant features that top of the line play sets have, but that does not mean that your kids cannot have their own swing set. Our ballin’ on a budget option has a lot of value for a young child, which will entertain them for hours on end. The Flexible Flyer “World of Fun” Swing Set is manufactured from a company that has been trusted by parents for generations. This swing set features a metal frame that is black and grey. It has been painted with a powdered coating that is designed to add strength and durability to the play set. The rest of the swing set is made from a lime green plastic material. This swing set can accommodate ten small children between the ages of two and ten at one time. To ensure that small children do not pinch their fingers in the chains on this play set, they have all been covered with a rubber coating. Assembly is simple with this play set, so it should only take a few hours to completely set up. Make sure to anchor down the “World of Fun” Swing Set, which will provide more stability for your kids to safely swing as high as they desire. Once it is completely set up it should measure 17.75 feet in length, 10.8 feet in width, and six feet in height, which is a bit smaller than some swing sets, but it is the perfect size for young children under ten years of age. This swing set features a six foot wave slide, which is always a favorite for toddlers. It has two swings as well as a trapeze swing that will provide hours of entertainment. It also features a traditional two person glider where the kids face each other and a rocker rider where they sit back to back. This swing set also has a feature that no other swing set on our list has. The “World of Fun” Swing Set has a see-saw, which is sure to become a favorite feature in no time at all. 89 percent of the Amazon reviewers who have purchased this swing set for their children have rated the product with at least a four star rating. One Amazon reviewer said this about the swing set: “This is an awesome swing. It is sized for younger kids (3-10 yrs old) as everything is fairly low to the ground. The swings have plastic covers on the chains, so no pinched fingers. Slide is a blast.” The Flexible Flyer “World of Fun” Swing Set can be purchased on Amazon for about $245, and that includes a 180 day limited warranty. As a parent, you will most likely know what features of a swing set are the favorites for your child, but it never hurts to let them see different play sets and show you the ones that they like the best. If you have a small child, you may even wish to swap out a normal swing for a more secure baby swing. If you only have one child, it may not be the best choice to have features that require two children, such as a see-saw. Make sure that you know the actual dimensions of the swing set you plan to purchase. Is your yard large enough to accommodate it? Make sure to save space for other outdoor activities that your kids may want to enjoy, such as baseball, soccer, riding bikes, or simply playing tag. The swing set cannot take up the entire yard, so make sure to consider what space you actually are able to use. Also, if you have an exceptionally hilly yard, make sure that there is enough flat ground for the play set. If you decide to get a metal swing set, make sure that it is made of a durable material that will last through inclement weather. They are typically coated with a finish that will prevent the metal from rusting in the rain or snow. Wood play sets are different, because they can be constructed from different types of wood, which means that the quality of one wooden play set may not be the same as another. The most common wood types for swing sets are cedar, pine, and redwood. Pine is an extremely durable type of wood for a play set, because it is preshrunk and preserved, which means that the finished product will not shrink, warp, or crack as easily. It is a great choice for a swing set that will need to withstand a lot of harsh winters and rainy seasons. Redwood is a beautiful wood that is commonly used for play sets. It is a type of wood that is naturally resistant to insect damage, rot, and decay. Cedar is an option that is not quite as strong as redwood, but it is a bit cheaper to purchase. If you do decide on cedar, just make sure that the wood is thick enough to support the weight of your kids. Cedar is also very resistant to rot and decay. Hundreds of thousands of kids end up in the emergency room every year because of accidents that occur on the playground. Safety is an important consideration to make when choosing any play set for your kids. Let’s start with the frame, make sure that the entire frame is constructed from at least four by four beams of wood. The actual swing beam should be a six by four to make sure your children are safe. Make sure that the play set you choose has no sharp edges that could cut your child. All corners should be rounded or capped, and all chains should be covered with hand grips. High platforms should be enclosed so that small children do not risk falling off. Also, confirm that there are not small areas on the swing set where a child could get stuck. Metal slides are also a concern that may burn a child, so try to get a plastic slide instead. Some swing sets attach swings directly from the monkey bars, which can be dangerous for a child, so make sure to avoid the danger of your child becoming tangled in the swing while they are having fun on the monkey bars by avoiding play sets that are designed in such a fashion. Also, make sure that the ground is soft enough to safe guard your kids. If the ground seems hard, then place a layer of sand, mulch, or other soft material in areas where falls may occur. Some play sets allow you to customize the features you want included. If you have three children, you may want to take out the trapeze bar in favor of a third swing. If you have a small child, you may want to exchange a traditional swing for a baby swing. Maybe you want a climbing wall instead of a traditional ladder, or you may even want to substitute a cargo net in its place. It is great to be able to customize the swing set to your child’s wants and needs instead of being forced into a specific design. Some also have the option to customize and add items as your children grow. You may not want a see-saw when your child is two years old, but it may be a feature you wish to add when they are six. Once you decide which swing set is right for your family, there is a good chance that you will have to put it together. How simple is that process of building the play set? How long will it take if you need to assemble it alone? Some swing sets are extremely elaborate, which means that you may need the help of someone who can perform a professional installation. Be aware that some play sets need to be secured, which can mean that you will also need to pour cement to have a stable play area for your kids. How old are the children who will be playing on this swing set? If you have young children, do you really want a platform that is six feet off of the ground? If your kids are older, will they be happy with a dinky little three foot slide? Of course not, so when you consider which play set is best for your family, make sure the dimensions are right for your kids. Another major consideration for which swing set is appropriate is the number of kids who will be using the play set. Do you have a lot of guests over who have young children? If so, then you may want to make sure that the swing set will be large enough to accommodate them as well as your kids. Price does not always mean quality, but you do need to remember to keep your budget in mind when selecting a swing set. Some play sets can be as much as $5,000, so make sure you know what you are getting into before you let your child choose which swing set they want. It’s better to set parameters rather than tell them no once they have their heart set on a certain swing set. Having a swing set in your backyard can mean the difference between a bored child who is always watching shows on the television and an energetic kid who is always outside exploring and using their imagination. Swing sets are in no way created equally, so make sure that you know what your child would want in a play set before you start. Consider safety as well as the other considerations we set forth for you here, and then make a decision that will make your child happy for years to come. The whole reason you are considering getting a new swing set is to see your child jump for joy when they see their gift, but it can also provide a way to entertain their play dates, cousins, or other children who visit you. What are some of the features that your kids would like to have on their new play set?